Captains Cove Outfitters in Inglis and Yankeetown Florida is your one stop for fish bait, fishing tackle, ice, boating supplies and Kayak rentals. Captains Cove is the First Stop for your next inshore or offshore fishing trip to the Nature Coast of Yankeetown Fl. 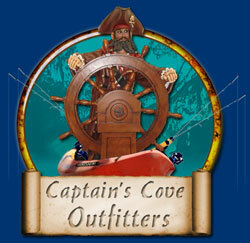 The Captains Cove bait store stocks a wide variety of fresh or frozen baits and special orders are gladly accepted. Hunters and Fishermen can get ice from their 24-hour self-serve ice machine. Captains Cove is close to Lake Rousseau, The Withlacoochee River, Gulf Hammock and the Gulf of Mexico.